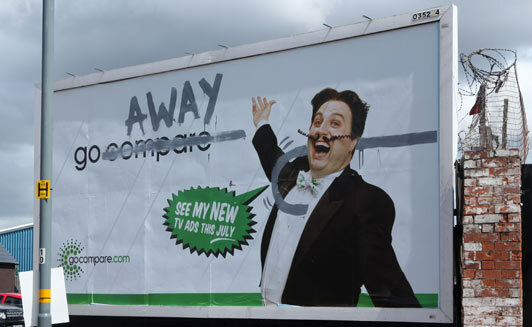 Go Compare.com have taken the social media sites by storm with the release of their latest marketing campaign. 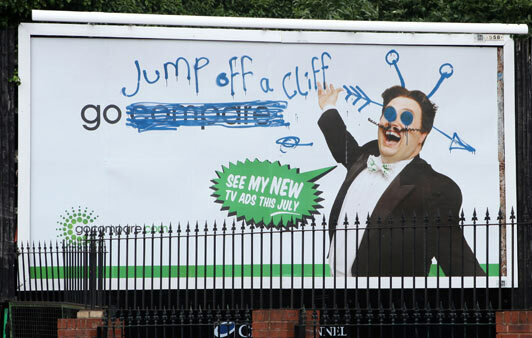 Since 2009, the Go Compare singing man has been one of the most loved and hated advertising characters in recent years, driving the british public crazy with his unbearable singing. It seems that now the frustration has reached a peak, with images of defaced billboards circulating Twitter and Facebook hours after the new range of adverts were launched. Rather than serial vandalism across the UK, it appears that the new adverts are a cunning new scheme by the company which sees the company take a new line of self-deprecating humour. A great marketing move in our opinion – but would you be brave enough to play with your brand like this?